are extroverted and some are introverted. start things and others finish things. Despite how different you each are, do you appreciate your spouse’s personality? How can you appreciate your spouse’s personality? 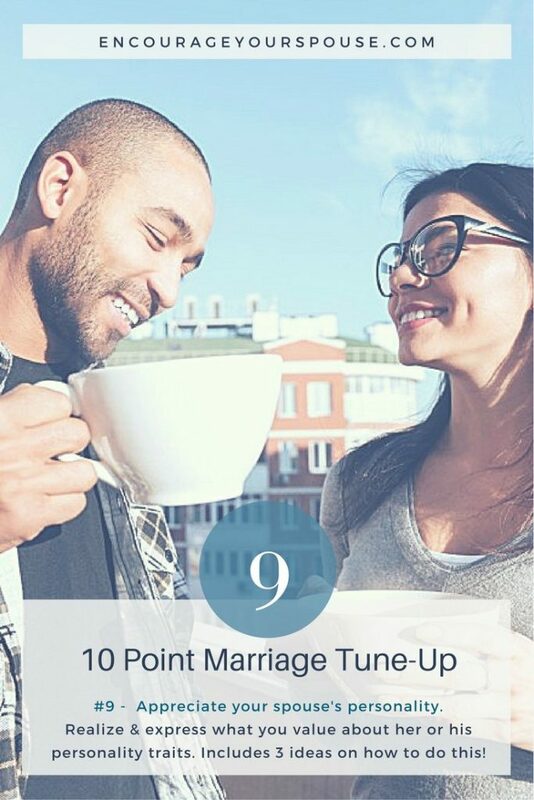 The first step is to realize all the positive aspects of your spouse. Have you ever tried a Myers-Brigg assessment? There are many options which are free online. It provides one of 16 personality profiles. (Just google Myer-Brigg). You could compare your DiSC profile. Robert facilitates this behavior style profile and has the option of adding to the secular side of the assessment a Biblical portion to describe patterns of behavior as they relate to Biblical persons. Learn more HERE and connect with Robert for the assessment details. Pick up two copies of the book “StrengthFinder2.0” to learn about your spouse’s strengths – you’ll need two separate codes to complete the online assessment, that’s why you need two books for the two of you. We’ve done this with our adult children and it’s been fascinating to review how we all deal with life differently. Do the Prepare/Enrich program – it includes a SCOPE assessment that highlights how you and your spouse are the same and different, so you can appreciate your spouse’s personality. Connect with Robert and me to do the Prepare/Enrich program. Once you realize your spouse’s positive personality qualities, then what? 1 – Grab some sticky notes and write out a short sentence about one aspect per sticky note. Then place them all over the house. Robert did that for me and he was blown away by how much I appreciated those words of affirmation. 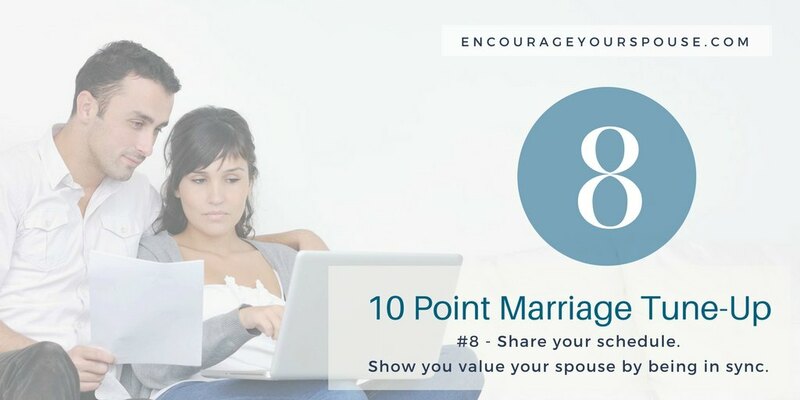 3 – Use your time in shared prayer to remind your spouse how much you value her/him. 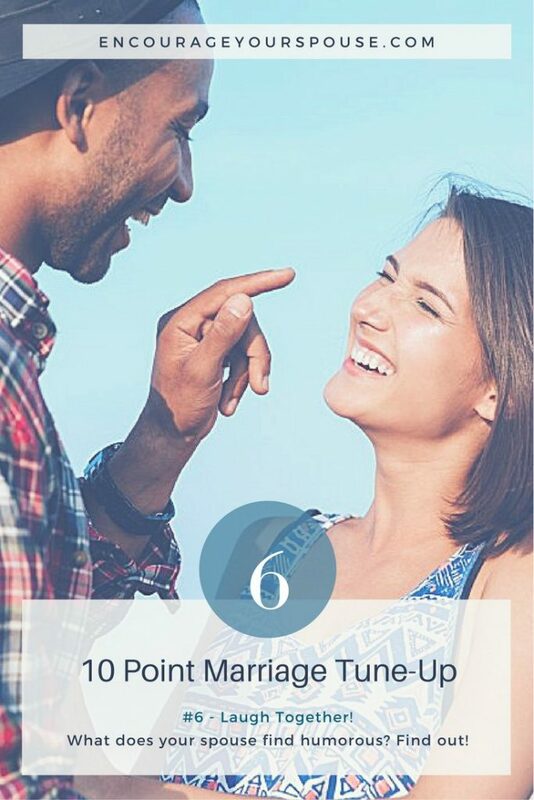 Thank God, out loud – for these aspects of your spouse’s personality. Do you pray together? If you haven’t prayed together in a while, here’s an article that might help you. 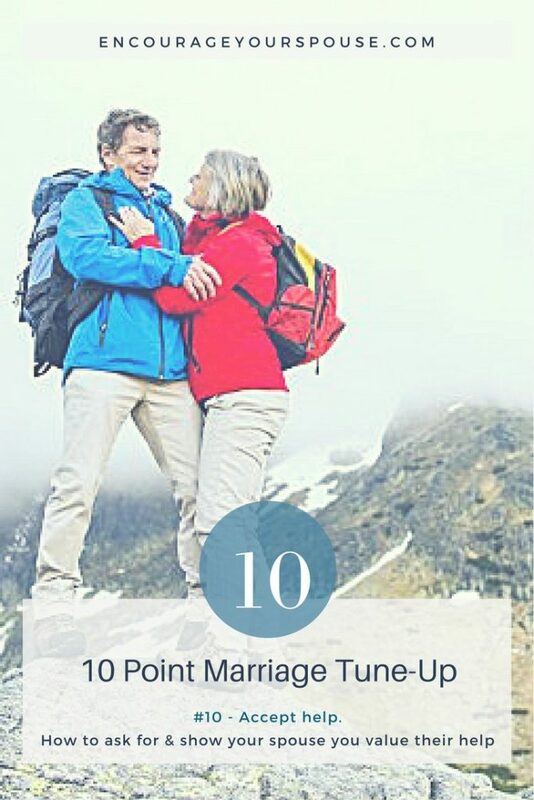 Do one of these activities – or all three – to show you value and appreciate your spouse’s personality! 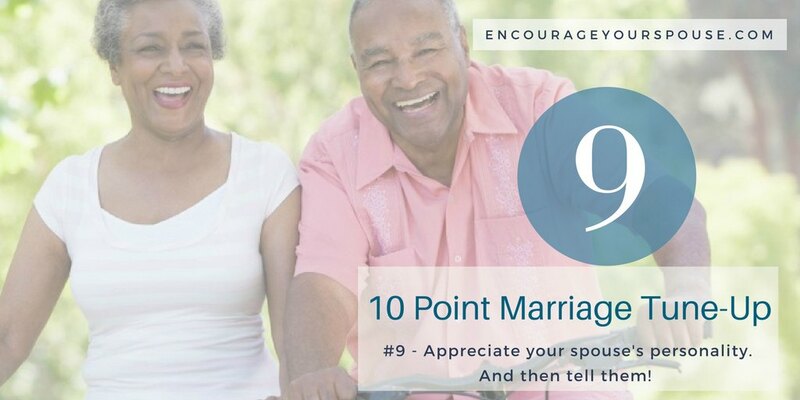 Take Action to Encourage Your Spouse! Share your schedule with your spouse – it’s part respect, and part connection. 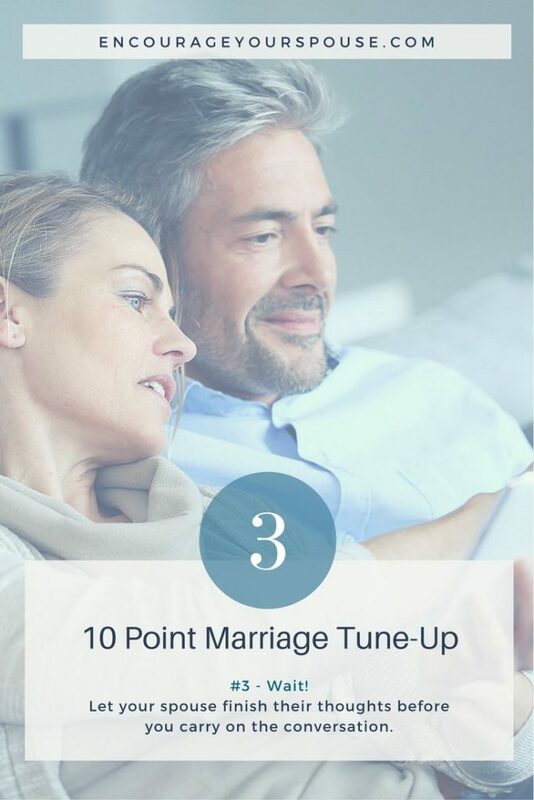 This article is part of the 10-point marriage tune-up. 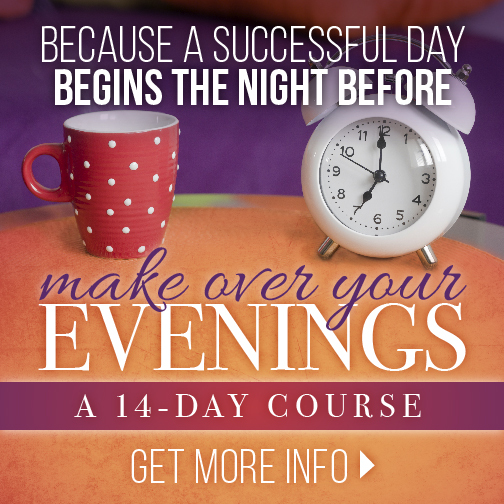 Share your schedule with your spouse. Sometimes our daily chores can become an unexpressed burden. Perhaps we don’t even allow ourselves to realize how much of a burden, It seems like that stuff just needs to get done, so we do it. Tasks aren’t exciting or world-changing, so we don’t talk about them. We just do those silly chores. However, one of the ‘perks’ of being married is being involved in your spouse’s life. Being involved also means being aware of the small stuff. It’s more than saying “thank you”, although appreciation is really important. Be aware. Take time to note what your spouse does and what you do. You know – I can hear in my head your rebuttal to this idea. Still – I’m going to suggest: Let your spouse know what fills your day. Ask what fills his/her day. Sometimes a glimpse into the other person’s responsibilities is enough to prompt a little latitude. He or she can be much more sympathetic if they understand why you feel so tired, so burdened, so overwhelmed at the end of the day. And so can you. Don’t make it into a long conversation. And.. DO NOT make it into a competition over who is more busy. Rob’s grandparents died decades ago, yet we remember them fondly. They were a special couple who appreciated each other very much. Yet this point still has relevance regardless how much they appreciated each other. Gran & Grandy were married for 52 years. Grandy passed and for many years after that, Gran constantly commented on how amazed she was at all the stuff he had done around the apartment. She didn’t realize what all he’d done at the time. Why did she notice? Because now she needed to do it herself. Who takes care of what in your life together? Take the time – now – to really see what your spouse does for you and your family. Share schedules. 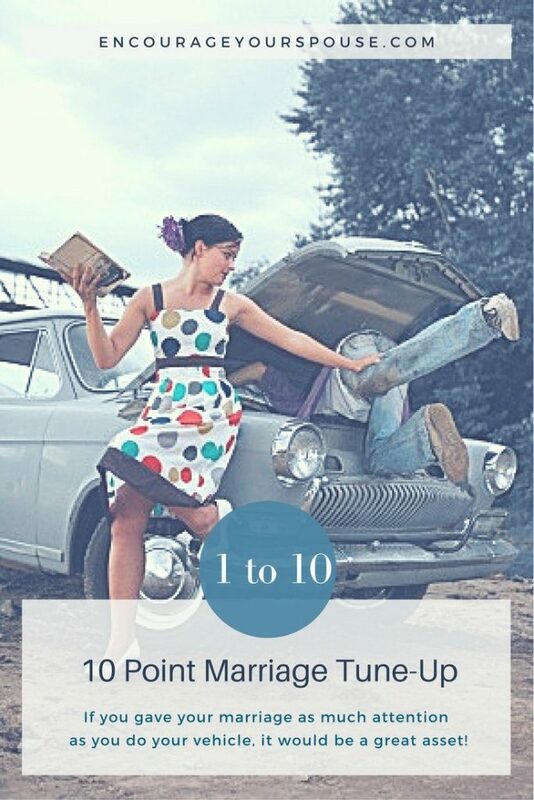 Maybe you could do a few of those tasks that are making your spouse overwhelmed? Maybe. 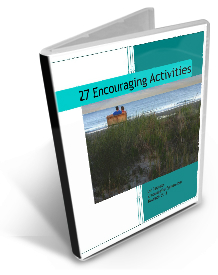 In the Prepare/Enrich program there is a Role Exercise – couples complete a list of the things they do in the day-to-day aspect of the relationship and then there are some discussion questions. 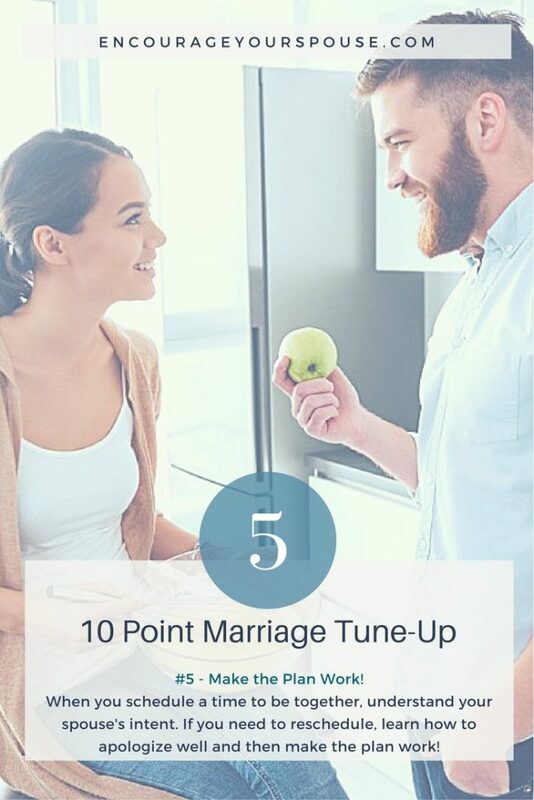 Even though this program is targeted at engaged/newlyweds, Rob and I feel it’s also valuable for couples married many years. Learn more about the Prepare/Enrich program here. 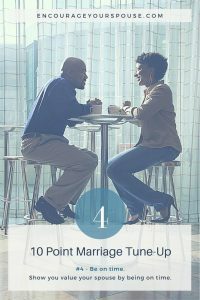 Connect with Rob and me to chat about how we could mentor you and your spouse for a short bit using this as a tool. See our MENTORING page. Family qualities. Quirks. Idiosyncracies. They show up in your spouse. Some behaviors, likes/dislikes, mannerisms, etc. you might appreciate and others are so different from your family that you find them difficult to connect with. Not one family on this planet are perfect. Not even yours! Some of those unique qualities (probably many things) about your spouse appealed to you when you were dating and decided to marry. Remember? No family on this planet is perfect. (Yeah – not even yours!) Remember that. 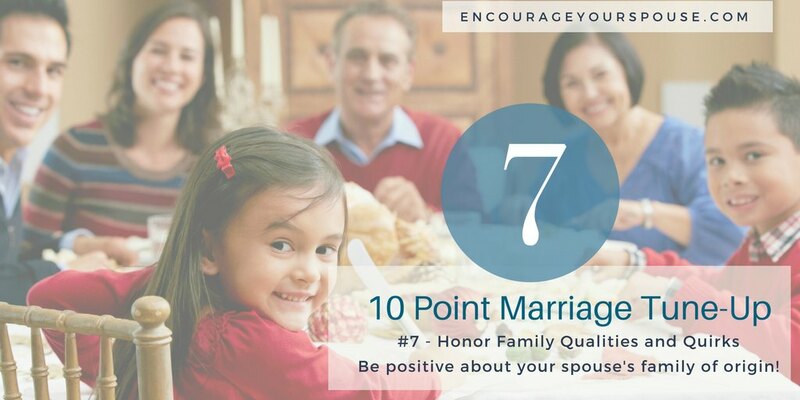 And then honor your spouse’s qualities that originated in their family. Acknowledge the good stuff in your spouse’s family of origin. Your spouse is the product his/her upbringing. Maybe it’s easy to identify all the reasons his/her family contributed to such a great person. Maybe it’s not easy. are they open, fun and love to joke or studious, academic and serious? There are good things about each end of the spectrum. is your spouse’s family careful with money, and good at saving or are they expansive and enjoy sharing what they have? Both are good, depending on how you view it. does your spouse’s family like to spend every weekend together, or are they more a once-a-year kind of gatherers? Usually, with some careful consideration, you can identify something about your spouse that you realize came from the way he/she was raised. Family qualities can be both a positive and a negative. Focus on the positive and try to mitigate the negative. 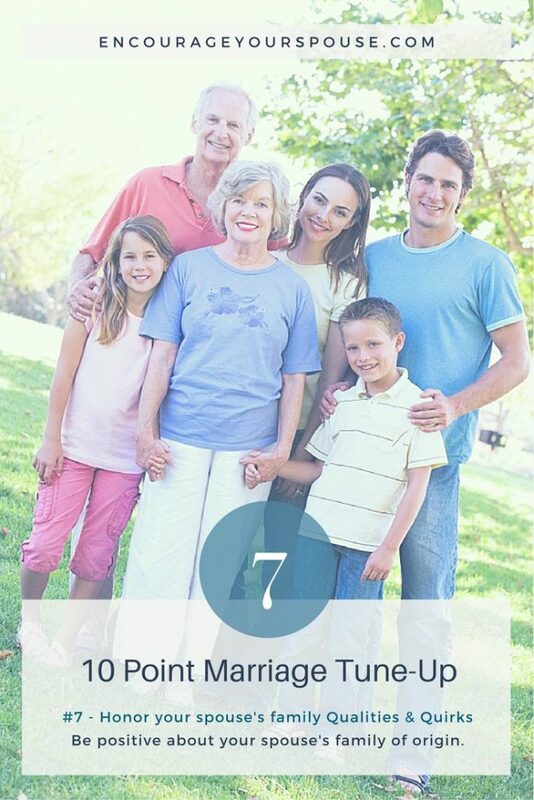 But in all things, try to honor the positive parts of how your spouse was raised. By doing that, you’re also demonstrating you value your spouse and where she/he came from. At the beginning of Prepare/Enrich program couples answer questions separately in an online survey. Included in these questions are details to demonstrate how they grew up. Some couples are very similar in the way they were raised and others are quite different. It’s not bad or good. 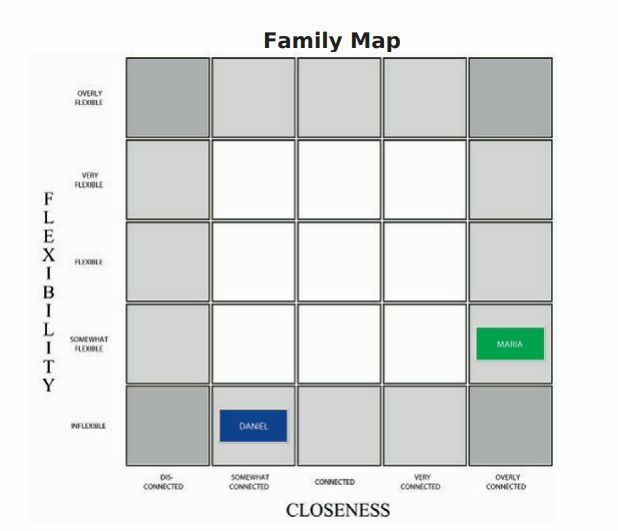 However, this Family matrix/map is so useful. Sometimes just seeing this map provides an answer to the couple’s issues with the other family. Using this map, and the corresponding exercises we can delve deeper in the family qualities that may hurt or help a couple in their own marriage relationship. Which family qualities do you value about your spouse? Rob and I talk often about the qualities in our respective families that have made us part of who we are. As an example, Rob’s family (especially his Dad) had/has fun being silly. My parents were quite serious. I like the parts of Rob that are silly and can directly see how his family had an impact on this part of him. Our adult children see this in Rob and value it also – it speaks to who they are as adults also. 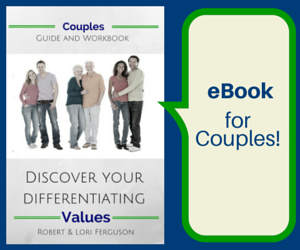 What do you see in your spouse that you value? Maybe it’s time you told her/him? 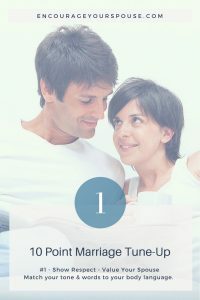 If you’re interested in being mentored, Rob and I can come alongside you and your spouse for a short bit to meet you and your spouse where you are, to encourage your growth as a couple, to nudge you toward taking action in areas you choose, to be with you as you tackle some tough issues, and provide resources to help organize your thought processes and realign your perspectives. 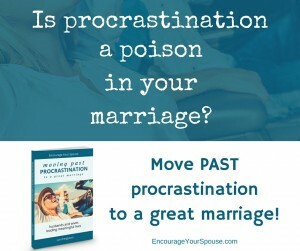 Go to http://encourageyourspouse.com/mentoring to learn more. Laugh together. It’s a wonderful gift to be able to laugh together as a husband wife. And this tandem laughter is another way to show you value your spouse if you understand what he or she finds funny. 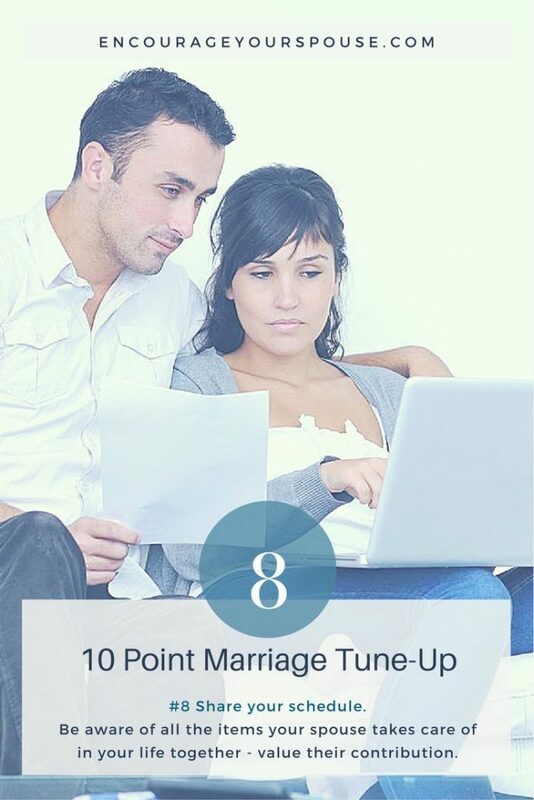 This post is 6th post in a series of a 10 point marriage tune up. When was the last time you chuckled, guffawed, snorted and had a good laugh together? As wonderful as all these kinds of laughter are, there may be times when what you find funny isn’t something that makes your spouse laugh. As much a laughing together is important, it’s also imperative to understand your spouse’s sense of humor. Understand your spouse’s sense of humor. Jokes are great – laughter is healthy. But not everyone is comfortable with raw humor or teasing comments, especially in public. You may not have thought of humor as a way to show your spouse you value them… but it can be. 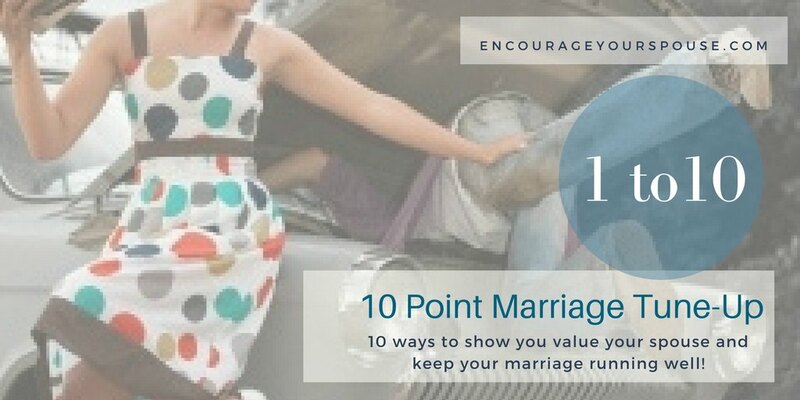 Show you value your spouse by being sensitive and discerning. 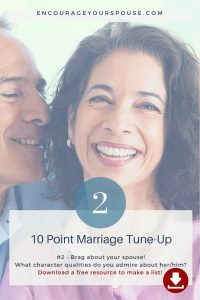 If your spouse is sensitive – to risque humor or humorous personal stories – then now is time to discuss the topic of good humor and uncomfortable humor. Preferably have this conversation in private between just the two of you. This might be a tender topic. It might hold some surprises for both of you. We don’t always call out our spouse in public when a story hurts or a joke makes us uncomfortable. It might be forgotten after the fact. Now is the time to discuss it – when nobody is heated or hurt. Once you both know what each other finds funny, then you can decide how to handle the humor. 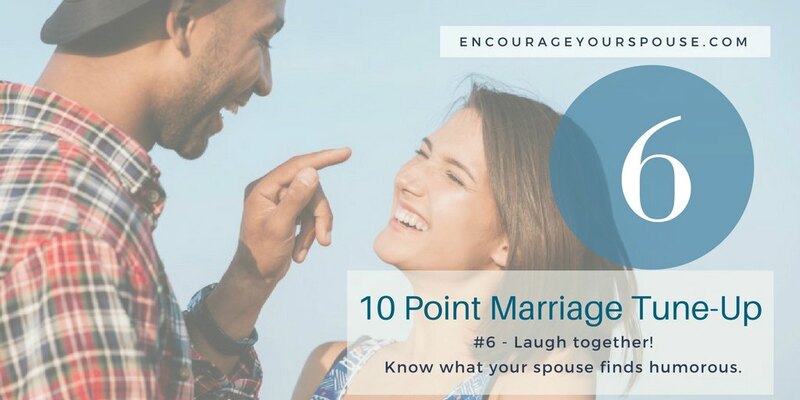 Decide on a plan of action – perhaps you only share risque jokes when your spouse isn’t with you – perhaps you never share a personal humorous story that involves your spouse. To show your spouse you value him/her, settle on a comfortable plan to honor your spouse’s sense of humor. Then go ahead – laugh together! Go on YouTube and take turns sharing the comedy you both like. Seek to understand what your spouse finds funny. It’s always possible to learn new ways to laugh together! Here’s a movie that makes Rob and me laugh Have you hear of My Man Godfrey? With 10 seasons available on DVD we chuckle every night. This is Robert’s favorite series right now, although he prefers the first few seasons as opposed to the more recent ones. If life gets strained, we’ve used these short episodes (without ads they’re only 20 minutes) to unwind at the end of the day. It’s something so familiar right now that they’re almost comforting… Is that healthy? Maybe. 🙂 “They” do say that laughter is a good medicine, right? And as another example, we find dark British humor entertaining… (Not everyone would find this movie funny – but we do!) It’s filled with a stellar cast: Maggie Smith, Rowan Atkinson, Kristen Scott Thomas, and even Patrick Swayze. Keeping Mum is a dark comedy. Oh, but so funny. This is another movie we’ve shared with select friends and our adult children. It has us saying, “Shall I put the kettle on?”… and then giggling. 😉 And when someone at church references needing to do the flowers for the Sunday… well, we just look at each other and howl. Which comedies make you laugh together? Which ones do you share with friends? Leave a comment!